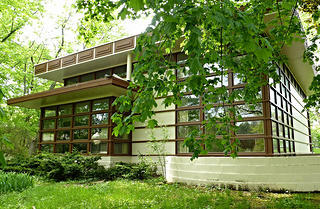 The 1959 Walter and Mary Ellen Rudin House. In the spring 2016 issue of Preservation magazine, we give you an insider’s view of the best places to stay, eat, and see in the state capitol city of Madison, Wisconsin. Madison has an abundant dining scene and miles of bike trails and shoreline, but it’s also rich with connections to one of America's most beloved and renowned architects: Frank Lloyd Wright. Wright lived in Madison in his adolescence and in nearby Spring Green during the height of his fame, and you can find his low-slung Prairie-style houses and grand public buildings scattered throughout the city. While several of Madison's Wright-designed houses are still private residences, structures like the Monona Terrace and the First Unitarian Meeting House are must-see spots for architecture buffs and Wright devotees. Below, we’ve highlighted five essential Wright-designed structures to visit in this lakeside city. Wright was fascinated by the concept of prefab housing, and he collaborated with builder Marshall Erdman, his colleague on the First Unitarian Meeting House project, on eleven of them in total. The prefabs were one part of his larger Usonian project, meant to make innovative design more affordable to the middle class. The prefab packages designed by Wright (three in total, although none of the third-generation models were ever built) that Erdman offered through his company Marshall Erdman & Associates, Inc., included interior and exterior walls, floors, windows, doors, cabinets, and woodwork. The prospective buyer had to provide the lot, as well as the foundation, plumbing fixtures, electric wiring, heating units, drywall, and paint. This house was completed in 1959 for UW-Madison mathematicians Walter and Mary Ellen Rudin, and is virtually identical to the James McBean Residence in Rochester, Minnesota. 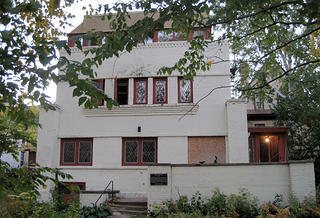 The 1903 Robert M. Lamp House is one of the earliest examples of Wright's Prairie School design. Designed for Wright’s childhood friend Robert Lamp (the two boys allegedly became chums after fighting each other in the schoolyard), the Lamp House, completed in 1903, exemplifies some of Wright’s signature touches like a compression/release dynamic (i.e., the narrow driveway between two neighboring houses opening up to the much larger lot where the house sits) and commercial cream-colored brick, which Wright also used for his own home and studio in Oak Park, Illinois. Located just two blocks from Madison’s Capitol Square, the house once boasted rooftop views of nearby Lakes Monona and Mendota, perfect for boating enthusiast Lamp. Those views, however, are now largely blocked by newer development. The Lamp house is still under private ownership, although some neighborhood residents have advocated that it be turned into a Wright museum and visitors' center. 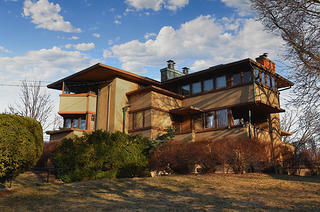 Wright's National Register-listed 1908 "Airplane House." The 1908 “Airplane House” was commissioned by Eugene A. Gilmore, a law professor at the nearby University of Wisconsin-Madison. Located on a hilltop, the house’s elevation and cruciform shape give viewers the impression that it’s about to take flight. The Airplane House is widely considered to embody the essence of the Prairie School style of architecture, with an emphasis on horizontality, rows of casement windows on both floors, and a cantilevered porch roof. The house’s second owners, the Weiss Family, expanded it in 1928, adding a larger kitchen and eventually a three-car garage. The Airplane House remains a private residence. The First Unitarian Meeting House is one of two Wright-designed Unitarian churches. 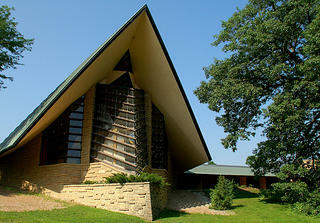 Completed in 1951, this National Historic Landmark houses one of the largest Unitarian Universalist organizations in the United States. Wright, who was born into a Unitarian family and identified as a Unitarian throughout his life, also designed the Unity Temple in Oak Park, Illinois. The limestone and oak Meeting House, with its distinctive copper roof, embodies one of Wright’s core principles: unity with nature. Tours are available throughout the year; consult the First Unitarian Society of Madison’s tour schedule to check availability. 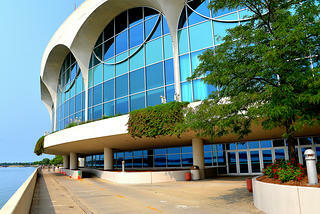 The Monona Terrace, originally designed by Wright in 1938, wasn't constructed until after his death. Wright designed this civic center for the city of Madison in 1938, but had trouble securing public funding for the project. He continued to seek support for its construction until his death in 1959. The state finally approved funds for the Monona Terrace Community and Convention Center in 1992, 33 years after Wright’s death, and his vision was finally completed in 1997. Although the exterior design is completely Wright’s, the interior, as executed, was designed by Anthony Puttnam, a former apprentice to Wright and member of the Taliesin Associated Architects. Today, the facility hosts over 600 annual conventions, as well as community programs, guided tours, and, in the summer months, a rooftop cafe.